Are you ready for e-LIVE interpretive training? JVA (John Veverka & Associates) is pleased to offer the first of several e-Live interpretive training courses being developed by Professor John Veverka. 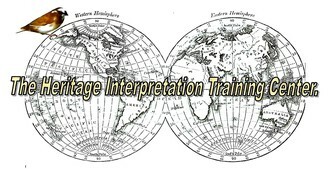 We feel that any interpretive training experience should be taught by professional Certified Interpretive Trainers with college level degrees in heritage interpretation (ideally at the M.S. or Ph.D. levels) and/or with years of actual interpretive experience in the courses being offered, to deliver college level interpretive training courses. We also know that while many folks would like to attend formal interpretive training courses, time away from the office/home, course fees, and related travel expenses often made this an expensive proposition. With e-LIVE the coach comes to you. you keep for your library. - You'll be given a writing assignment for each unit which you'll send to John for review, comments and writing coaching. You'll be able to talk with John about each assignment via SKYPE, or by e-mail or phone. Thus the e-LIVE opportunity. John will be your instructor and writing coach who you can talk with at any time about your assignments. Remember that John is in Michigan (Eastern Time Zone), so it's best to e-mail John to set up a time to chat. - When you've completed the eight units you'll be awarded a Certificate of Completion and 2 CEU (Continuing Education Unit) credits. Additionally, you can work on writing assignment for actual projects you may be working on - museum labels, marketing materials or other interpretive writing projects. 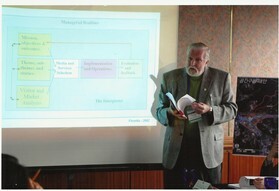 That is the benefit of e-LIVE - we are flexible in designing the course to meet your real-world needs. Unit One - What is "interpretation" anyway? - How to use Tilden's principles in basic text writing. - Examples of interpretive text using Tilden's Interpretive Principles. Unit Two - Planning for Interpretive Writing Projects. - The model of interpretation - planning for developing interpretive text/copy. * Writing to illustrate an interpretive theme. * Who is your audience - writing to connect with different learning styles. * Where will the writing appear? (Interpretive Panels, Exhibits, leaflets, web sites?). * Time, energy and costs for writing interpretive text/copy. * Implementation - getting ready for the final copy. * Evaluation and pre-testing your copy. Unit Three - Tangibles, Intangibles and Universal Concepts. This unit will explore the use of tangibles, intangibles and universal concepts in your interpretive writing. We will provide examples of each in handout materials. Using these concepts is how you'll really be able to connect with and relate to your audience. Unit Four - Writing with feeling and imagination. In this unit we'll look at using a variety of writing basics in creating really wonderful interpretive copy. Unit Five - Writing for Museum Exhibits. In this unit we'll look at how the label copy needs to work with the graphics and artifacts in the exhibits as well as be interesting and interpretive. * Writing toward exhibit objectives. * Writing layers (headlines, main copy text, sub-copy text, captions. * Copy point size and fonts for museum exhibits. * Say it in 50 words (Provoke, Relate and Reveal). * When a word becomes a picture. Unit 6 - Writing for interpretive panels and wayside exhibits. This unit will follow many of the concepts in the exhibit label copy text writing. Writing for interpretive panels needs to be theme and objective based as well. It also needs to reflect the interpretive plan for the total site the panels will be located in, contributing to the total site interpretive theme presentation. Unit 7 - Writing for self-guiding trail or tour leaflets. One of the most common writing assignments is developing copy for self-guiding trails or self-guiding walking tours. This unit will look at developing one story illustrated with 7-10 stops. Unit 8 - Writing to accomplish management objectives. This can include traditional issues such as marketing issues, safety rules and regulations, and related management issues unique to your organization. Projects will be individualized for your particular issues. The cost for the 20 hours training with live interaction with the instructor is $200.00 USD. Simply pay the course tuition (at the pay now button below). You can pay by credit card or paypal. If paying by check, you can mail your payment to John Veverka at the address below.